curl -L "$LIBS_ZIP_URL" -o "$LIBS_ZIP_FILENAME"
2. Make a folder named "ScummVM" anywhere you want. Inside, drop the prepare_workspace.sh script file. 4. Once Xcode launches, make sure Product Name in build settings is ScummVM (case sensitive!, see example: https://i.imgur.com/WyxBDsQ.png). One you do that, compile and it will work 100%. 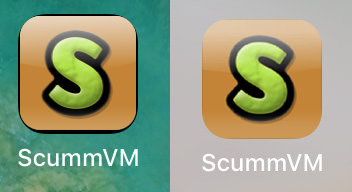 The app icon for ScummVM has been messed up from day one. The creators use a rounded corner image instead of a boxed image which makes it look off in iOS. See comparison here (original on the left): https://i.imgur.com/bLW59O3.jpg. Last edited by mic773 on Tue Apr 03, 2018 8:20 pm, edited 1 time in total. Thats how I did it too Lets try to incoporate this onto master in Github. Do you have any idea why I get this error? For information I'm using macOS High Sierra & XCode 9.2 (9C40b). I am guessing you saved your workspace.sh file as rich text. If that is the case you need to convert it to plain text, which you can do in TextEdit (see for example http://osxdaily.com/2012/05/08/convert- ... -mac-os-x/). how to you solve the provision profile requirement?